YOU CAN, make more room for the rest of life. 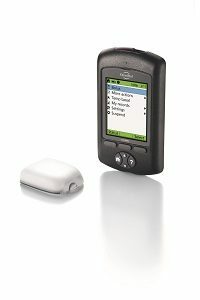 • Delivers insulin based on your child’s personalized settings. • Adheres securely to most places you’d give an injection. • Insertion is automatic and virtually pain-free – with no needles in sight. • Waterproof* so there’s no need to disconnect for bathing or swimming. • Simple, intuitive sentences walk your child through every step. • Can be stored in your child’s pocket, backpack or purse – no need to clip anything to your their clothing. • Built-in blood glucose meter means one less things to carry. • Insulin on board (IOB) is calculated based on correction and meal boluses. Give your child a chance to feel what it’s like to wear the Omnipod® System. Learn more and order FREE Demo Kit here. They enjoy: Nancy likes seeing her son live life to the fullest and enjoys giving back to the diabetes community. Ryan enjoys not taking shots and just about every sport known to man. Why they love the Omnipod® System: Nancy feels good knowing she’s doing the right thing for her son’s diabetes management. It gives them less stress, more control, freedom and normalcy. *IPX8 (25 feet for up to 60 minutes). The PDM is not waterproof.